MyHA brings another exciting theme – “Halal Connecting The World” as a great platform to discuss and share ideas on how to drive the Halal Certification agenda forward to improve the global Halal Industry. Returning for the 9th year, the Halal Certification Bodies Convention (HCBC) in 2018 brings another exciting theme – “Halal Connecting the World”. HCBC is a convention that gathers together, leaders in the global halal industry, religious authorities as well as Halal professionals from all over the world to provide insights on the halal industry. Taking place from the 1st to 2nd April 2018, at the Le’ Meridien Hotel in Putrajaya, this event is a great platform to discuss and share ideas on how to drive the Halal Certification agenda forward to improve the global Halal Industry. 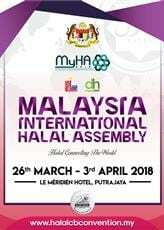 This year the con vention will be discussing the latest happenings and direction of Halal Malaysia, together with the latest development of the halal industry as a whole. This year the Department of Islamic Development Malaysia (JAKIM) together with its strategic partner DagangHalal will be introducing a prestigious programme called the Halal Professional Board Programme. Along with the 2nd International Halal Technical Capacity Development Programme (IHTCDP), these programmes will feature interactive mini-forums between halal industry players and JAKIM. The objective of these programmes are to discuss and bring together best practices in halal as well as finding possible resolutions for issues and challenges faced by the industry. This year’s Halal Professional Board Programme (HPB) will be introducing two new training courses. These courses are to be made compulsory to all Halal Executives under the Malaysia Halal Certification soon, according to the Director of Halal Hub Division JAKIM (BH Online – 9th February 2018). The primary objective is to enhance the competency of Halal Executives and Halal Internal Auditors. These two courses, Halal Executive and Internal Halal Auditor, will be a five-day training session, and the certificates awarded will be recognised by JAKIM. The 2nd IHTCDP 2018 targets global halal industry players along the halal supply chain. The objectives are to update the participants with new and emerging halal standards, address on how to manage innovation and the challenging availability of raw materials apart from presenting the industry players with the halal technical parameters of the Malaysian Halal Certification. Industry players from the food and beverages, cosmetics and personal care, pharmaceuticals and logistics should not miss this opportunity. Come and participate in one of the world’s biggest Halal convention. See you there!